Today, the Senate Finance Committee will hold a key vote on what has become known as the Baucus bill. Like most Texans, I believe that our health care system needs reform. Millions of families have seen the cost of their private insurance skyrocket. Many are worried about losing their coverage altogether. Seniors are concerned about the future of Medicare. 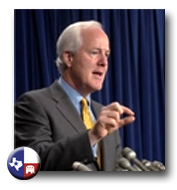 Texans have told me that they want to keep the coverage they have and don't want Washington to make things even worse. I believe health care reform should focus on lowering costs, which have more than doubled over the past decade. We can lower costs by realigning incentives for providers, so they focus on value instead of volume. We can create incentives for patients to make healthier choices. We can reform the private insurance market in every state to encourage greater competition and more choices, without denying anyone coverage because of a pre-existing condition. We can lower costs by cutting waste, fraud, and abuse in our current entitlement programs. And we can reduce costly defensive medicine by reforming our medical liability laws like we've done in Texas. The Baucus bill, unfortunately, will only increase costs for everyone. The nonpartisan Congressional Budget Office said the bill will cost $829 billion, but when it's fully implemented, the Senate Budget Committee estimates the real cost to be $1.8 trillion. Either way, it would still leave 25 million Americans uninsured, impose billions of dollars in new taxes and mandates, and cut more than $400 billion from Medicare. It would take away Medicare Advantage benefits from seniors, and make Medicaid the only option for 14 million Americans. The bill also imposes hidden costs on states. The Texas Health and Human Services Commission estimates that the Baucus bill would cost Texas more than $20 billion over 10 years and add 2.5 million Texans to Medicaid. That would mean billions in new state taxes, or draconian cuts in education, law enforcement and other Texas priorities. According to one survey, 91 percent of Texans who buy insurance in the individual market will see their premiums go up because Washington will force them to buy more expensive policies. My colleagues and I offered several amendments that would have improved the bill. We fought to protect Medicare Advantage, and eliminate the Medicare panel that would empower bureaucrats to make coverage decisions. We tried to reform Medicaid before forcing more Americans into it. We sought to lower costs on small businesses, and enact meaningful medical liability reform. Many of our amendments would have helped President Obama keep his promises to the American people, including those related to keeping what you have, taxes on the middle class, federal funding of abortions, and benefits to illegal immigrants. Yet most of these amendments were rejected on party-line votes. Perhaps most discouraging was the defeat of the first amendment Republicans offered to ensure a more transparent process. Sen. Jim Bunning and I proposed a 72-hour waiting period before we could vote on the bill. During those 72 hours, the actual legislative text, not just conceptual language, would have been available on the committee's website for the public to see, as well as a final price tag from the CBO. Instead we will vote on a concept, not the actual bill. I cannot support legislation being rushed through Congress that will increase the costs of health care without giving Texans the opportunity to learn what it would mean for them. Democracy demands that government be accountable to the people, and government that is open and honest can deliver better solutions. I will continue working toward better solutions on health care reform and ensure your voice is heard. I consider you to be a man of honor. I'm asking you to honor the promise our Constitution has given every American Citizen in that we expect the Truth & Accountability from the Statesmen we vote into office. This being said, this health Care Bill is not what the People want and is designed to Bankrupt of way of Life. Please sir, do not let this happen on your watch. May God Bless you & all other Americans that love this Country. My pledge to you is simple, I'm like the folks that gave their all at the Alamo to stand with you for what is Righteous or to fight & die trying to return our system back to the direction our Forefathers intended it to be. "It's never the wrong time to do the Right thing". I pray to God for your success.